Each unit has kettle, cutlery, wine glasses and crockery. Located just six miles from Banbury city, we are a straight drive off B4525 and turn down Banbury Lane to Thorpe Mandeville. 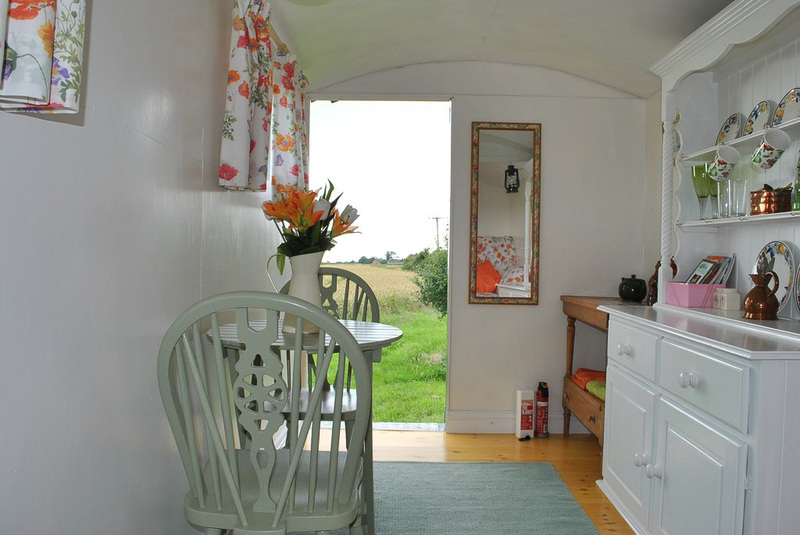 Glamping Thorpe is situated on a pretty Georgian farm which sits on the North Oxfordshire, Northamptonshire border. We are an arable farm of approximately 250 acres. Our glamping site is set in an acre of green pasture, which overlooks pretty countryside, and sheep are often kept in the field opposite. Each unit has its own private area as they are situated in the corners of the field to give you the most privacy possible from other glampers. On site, we have a composting toilet made from recycled materials. The outer building is made primarily from wood and tin and has been made into an interesting pyramid shape – a bit like a tipi! Our shower room has been converted from an old horse box and will guarantee to give you a whole new experience in washing! All our glamping units come fully equipped with kettle, cutlery, wine glasses and crockery. Each also has a gas stove for your use. Bed linen and fresh towels are included during your stay. Enjoy the country air and maybe a BBQ in your own garden area, which is partly covered by a gazebo to protect you from the elements! Inside Dolly, she's compact and bijou, but very pretty. Due to Dolly being quite narrow, we wouldn’t recommend anyone over 6 foot stay in her. You would find one of our other more spacious units more suitable. Its position in our field boasts outstanding views over open countryside and is the perfect spot for some of the most gorgeous sunsets on a summer night! It has plenty of room for two and boasts a very comfortable king sized bed. As with all our other units it comes fully equipped with kettle and cutlery, extra blankets and wine glasses. Sit outside under the gazebo, under which you can enjoy a BBQ or just chill and put the world to rights in front of the chimnea! It’ll definitely be an experience you wont forget! Items we recommend to bring: waterproof boots, torch, warm clothes, waterproof coat, kite, frisby and lots of wine!